The myth arises from the ever repeated assumption without scientific facts. Myths can be found in almost every human activity. It’s true for hair and hairstyles, too. Find out whether you know one or more from our 13 hair myths list. Our first hair myth concerns about combing. Slightly combing is OK, but frequent and long combing hurts your hair, disrupts and weakens it’s structure. Choosing the appropriate brush or comb can mitigate this effect. Hair grows about 1.5 cm (0.6 in) per month, no matter if it is cut or not. 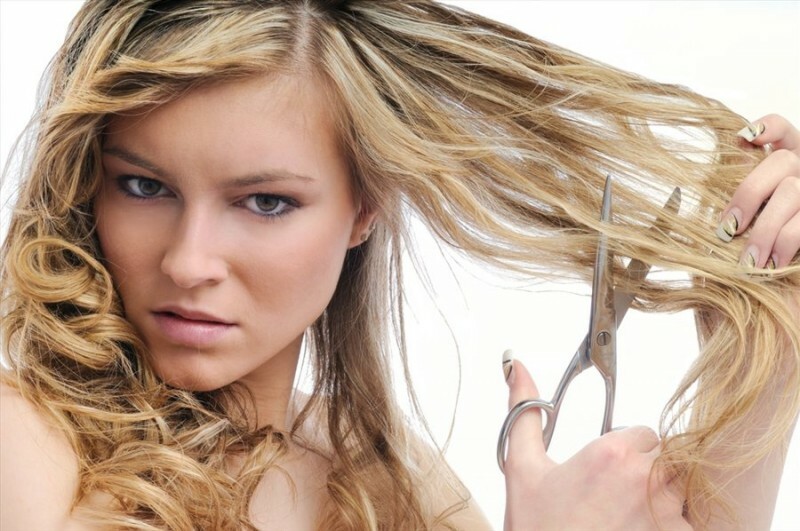 What do certainly help to make your hair looks better is to cut split ends of your hairs regularly. From 50 to 100 “dead” hairs are considered to be natural. It’s normal and stress has nothing to do with this natural process. But significant hair loss can be caused by some “catastrophic” experience and stress, such as loss of a loved person, divorce or life-threatening operation. In such cases, your hair can even actually turn gray. The main causes of hair loss are hormonal and changes in the natural functions of body processes. Another absurd hair myth. Nowadays, modern hair dyes are enriched with plenty of nutrients that strengthen hair and promote its growth. Therefore, you shouldn’t have a problem with the dyes. Watch out for aggressive chemical hair dyes. No scientific research has been made on this topic. However, it is wise to don’t color your hair for the first 20 weeks of pregnancy, at least. And choose a dye that doesn’t contain formaldehyde. Cold water is certainly refreshing, but don’t have beneficial effect on hair. You can use cold water to increase the circulation in the hair follicles and/or to reduced sensitivity to cold. From a medical point of view this is not true at all. Bad habit of gray hair plucking is bad for another reason: creates scalp irritation which can be harmful to the hair follicle. Unfortunately, split ends can’t be restored. All you can do is to trim them. Split ends may be temporarily reinforced by products containing silicone or beeswax, but don’t expect miracles. This myth about hair is also not true. Short hairstyles fit every woman with big eyes, long neck and natural confidence. The idea that long hair is not suitable for women over 40 is there probably because of the loss of hair volume by age. This myth may seem ridiculous, but it was taken seriously some time before. However, hair loss is mainly due to hormonal changes (after a certain age, during pregnancy, etc.) or lack of substances in the human body, necessary for the hair growth. Hair can also be washed every day, even without shampoo. The right shampoo will actually add moisture and remove grease. You may be surprised, but the opposite is true. Proper diet, rich in amino acids, vitamins and minerals, can improve the condition of your hair. Diets without this substances can affect the quality of your hair. Not all hair care products sold in health food establishments are completely natural and may contain chemicals like SLS. You should read the label to be sure. These hair myths are not all myths, but are the main in our society. Feel free to discuss them in comments. Thanks.